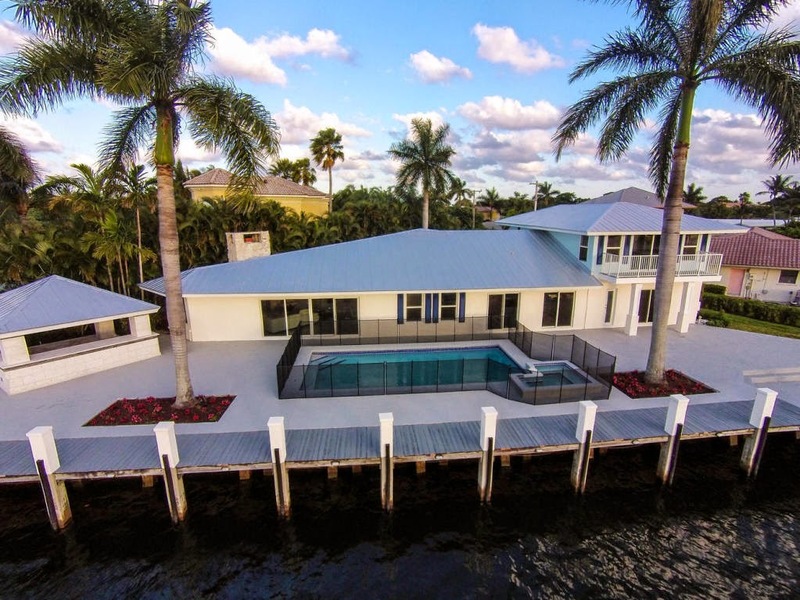 Ideal for those seeking private waterfront living is this magnificent 4BR/2BA home perfectly sited on 160 feet of direct water frontage in Ocean Ridge, Florida. Tucked away on a quiet cul-de-sac lot, this idyllic Key West inspired Ocean Ridge gem showcases sweeping water views throughout its 3,600 square feet of casually elegant living space. Bright and open, the stunning interior of this Ocean Ridge residence showcases a wealth of deluxe features including an expansive gourmet kitchen with a full suite of high-end stainless steel appliances, a generously proportioned master suite with private balcony, luxuriously appointed master bath with private terrace and Jacuzzi tub, spacious family room with white stone fireplace, stone tile and dark bamboo wood flooring throughout. Boasting equally impressive amenities, the outdoor spaces feature a fully equipped summer kitchen, swimming pool, spa and private boat dock with lift. 40 Hibiscus Way located in Ocean Ridge, FL is located in Ocean Ridge and is currently asking $1,699,900. This Ocean Ridge Beach listing is courtesy of Stellar Homes Realty MLS# RX-10111170. Ocean Ridge is a quiet seaside town serenely situated just east of Boynton Beach, Florida in prestigious Palm Beach County. Nestled along miles of Atlantic coastline, residents of Ocean Ridge enjoy a premier beachside location just a short drive away from the trendy shops, restaurants and nightlife in nearby Delray Beach, Florida.